Time for a Corporate Event! Time to take a break and have some fun with your Co- workers!. Race your freinds in our famous Adrenaline Rush, then work your way over to the 18ft GIANT DUEL SLIDE! 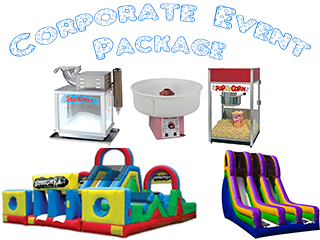 Then after that you can go sit down and enjoy some Popcorn, Cotton Candy, and a Snow Cone Machine. Comes Manned for 3 hours, Additional Hours are $50 each.